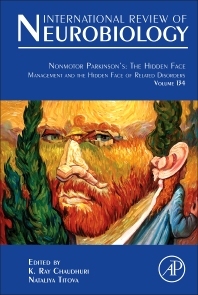 Non-motor Parkinson's: The Hidden Face-Management and the Hidden Face of Related Disorders, Volume 134, the latest release in the International Review of Neurobiology series, is an up-to-date and comprehensive textbook addressing non-motor aspects of Parkinson’s disease, a key unmet need. Specific chapters in this updated release include Therapeutics and NMS in PD, Non-motor effects of conventional and transdermal therapies in PD, Infusion therapy, CDD and NMS in PD, DBS and NMS in PD, TMS and implications for NMS in PD, Botulinum toxin therapy and NMS in PD, and Nutrition and NMS in PD, amongst others. Including practical tips for non-specialists and clinical algorithms, the book contains contributions from over 40 opinion leaders in the field of movement disorders. It provides practitioners and researchers with a laboratory, to bedside, to caregiver perspective. I enjoyed reading through this very comprehensively authored book on the non-motor features of Parkinson's disease. It highlights that there is a lot more to PD than what the patients report; it is not all shaking and not moving but that PD affects quality of life by its impact on almost all the systems and functions of the physical and mental nature. Right from the impairment of gastro-intestinal movements to the olfaction, weight, pain, sleep, intimate relationship, autonomic involvement of several tissues and modalities makes it vital to spend time with the patients to try to identify the problems as some of these might be amenable to management. Palliation is an overlooked aspect of care in advanced disease but so important for comfort in the last stages of life. There is however no generalisation and the patients would benefit from a personalised approach to manage these issues. A highly awaited and timely publication in the 200th year of James Parkinson's essay on the Shaking Palsy. Highly recommended to read, consult and practice. Professor K Ray Chaudhuri is the Clinical Director of the National Parkinson Foundation International Centre of Excellence at King’s College and Kings College Hospital London, Lead of the King’s Neuroscience Research and Development unit and Chairman of the Movement Disorders Society Non-motor Study Group at Denmark Hill Campus in London. Professor Ray Chaudhuri also sits on the Nervous Systems Committee of the UK Department of Health, National Institute of Health Research, and serves as a member of the Scientific Programme Committee of the International Parkinson’s and Movement Disorders Society. In addition, he serves as a member of clinical advisory groups to Parkinson’s UK and the European Parkinson’s Disease Association. Having published over 350 papers and co-edited 4 books on PD and restless legs syndrome, Professor Ray Chaudhuri currently serves on the editorial board of numerous international journals including Basal Ganglia, the Journal of Parkinson’s Disease and is the editor in chief of the newly launched Nature Parkinson’s Journal. Professor K Ray Chaudhuri has particular expertise in non-motor aspects of PD focused on subtyping, sleep and pain.